A two-bucket sequence highlighted a 12-4 run by the Seminoles as they pulled away from No. 4 seed Gonzaga for a 75-60 win in the Sweet 16 Thursday evening at Staples Center. LOS ANGELES, CA — It wasn’t how Terance Mann planned it, but after a spinning pass attempt bounced back to him, he knew exactly what to do with it. The junior guard attacked the rim and scored his final field goal of the game with 4:21 remaining. Mere seconds later Mann corralled a steal and immediately looked up court to start a fast break that concluded with a thunderous dunk by Phil Cofer. It was a two-bucket sequence highlighting a 12-4 run by the Seminoles as they pulled away from No. 4 seed Gonzaga for a 75-60 win in the Sweet 16 Thursday evening at Staples Center. Mann finished with 18 points on 8 for 13 shooting to lead a Seminole attack that featured 11 players scoring, but only Mann finishing in double digits. 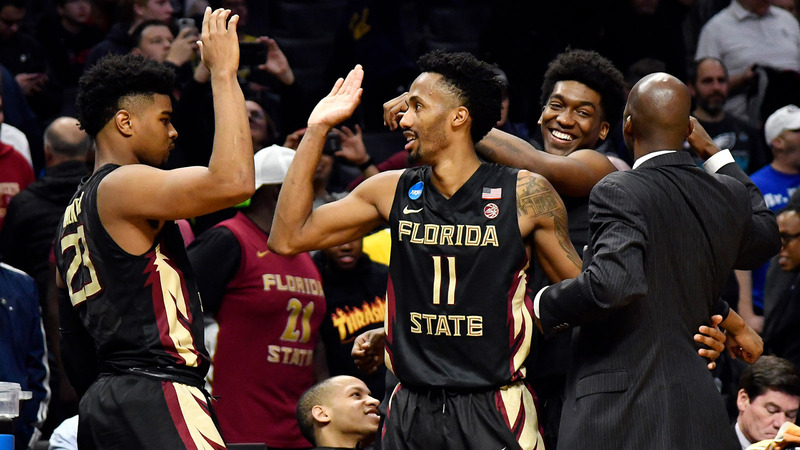 It took a team effort on both sides of the floor for the Seminoles (23-11) to advance to the Elite Eight for the third time in school history and the first since 1993. They will face Michigan Saturday at 8:50 p.m. EST after the Wolverines beat Texas A&M 99-72. Gonzaga finishes the year 32-5 after struggling to get NCAA tournament breakout star Zach Norvell Jr. going until it was too late. After scoring 43 points in Gonzaga’s first two tournament games, he started the game 2 for 13 from the floor. Norvell finished with 14 points after hitting two late shots, but it was too little too late. The Bulldogs were led by Rui Hachimura’s 16 points. It was a game of runs beginning with an action-filled back-and-forth first half. After a slow start in the first four minutes, Florida State jumped out to 16-6 lead with an 11-0 run with Trent Forrest stimulating the offense. He found PJ Savoy on the secondary break for a three-pointer from the top of the key that fired up the 19 friends and family Savoy had in attendance supporting him. Forrest also picked up a steal and transition bucket and set up an alley-oop dunk by Ike Obiagu a possession after nabbing another steal. Gonzaga quickly responded with a run of its own soon after Forrest subbed out of the game. The Bulldogs continually attacked the paint getting Christ Koumadje, Mfiondu Kabengele and later Braian Angola, Ike Obiagu and Phil Cofer all in early foul trouble. The first 12 points of a 15-0 run came in the paint or from the free throw line. It took a four-on-one fast break for Florida State to snap Gonzaga’s streak as the Seminoles struggled to adjust to the Bulldogs’ zone defense. Having to use a small lineup, Florida State unsuccessfully tried to shoot Gonzaga out of the zone. But it found success in the final five minutes of the half by moving the ball quicker. They started to find some soft spots with Forrest being able to get the ball at the high post where he could turn and attack the heart of the defense. Once they started getting in the lane, the Seminoles were able to get some open looks from outside finished the half on a 13-3 run to take a 31-32 lead at the break. Florida State held Silas Melson and Zach Norvell Jr. to a combined 4-for-14 shooting and seven points in the first half, but the forward combo of Jonathan Williams and Hachimura carried the load for the Bulldogs early. Hachimura, who started in place of Killian Tillie after Tillie re-aggravated a hip injury before the game, gave the Seminoles fits with his ability to attack the offensive glass, grabbing three offensive rebounds in the first half and 10 total. The second half featured an early 8-0 Gonzaga run to cut Florida State’s lead to five points, but the Bulldogs could never get closer than four and with 8:08 remaining, the Seminoles began to pull away. The 12-4 run started a 22-11 finish. Forrest finished with seven points, six rebounds, six assists, two steals and only one turnover. Florida State was +23 when he was on the floor.